I moved to Delaware in 2008, with a few stops between here and Jamaica, to start my career as a pediatric medical geneticist at Alfred I. duPont Hospital for Children. I inherited the Down Syndrome Clinic from one of my new colleagues and one of my first duties was attending the annual Down Syndrome Association of Delaware Dinner to accept an advocacy award on behalf of the clinic team. My husband and baby daughter accompanied me to the event and what first struck us was the warmth with which all these families welcomed not only me, but all of us. 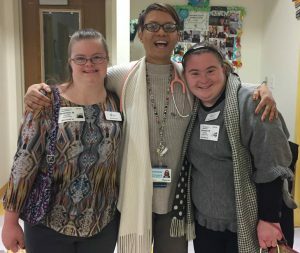 Almost 10 years later, I have had the honor of helping to care for many children with Down Syndrome as our patient population has grown and I have said aloud many times, that this is when I feel like a real pediatrician. I have been fortunate to work with a wonderful physician assistant, therapist, social workers and volunteers from the DSA of Delaware, who play an equal if not more important role than I do. I have been asked many times if children with Down Syndrome need a geneticist to take care of them, and even though I humbly admit that they do not, it is something I hope will continue for my entire professional life because it has been so fulfilling. About the Author: Dr. Nina Powell-Hamilton is the current Director of the Down Syndrome program at Alfred I. duPont Hospital for Children. Married to Andrew and mother to Gabby. Nina is a board-certified pediatrician and medical geneticist. She is pictured above with our two self-advocates, Rachel and Elizabeth, that work with her within the clinic.